In this write up, I will explain what truly set Cruyff apart from his predecessors and show what his predecessors brought to Barcelona (the pre-Cruyffians). Then I will explain how Cruyff influenced a set of managers in the years to come (post Cruyffians). In between these three parts will be sections that explain what was happening around Spain throughout those years to give context to the greater development of Spanish tactical football in those years (these sections will not be as detailed and can be skipped while still maintaining the key aspects of the story). Vic Buckingham (1969-71), an Englishman who found his fame abroad, was employed at Barcelona after his stints at Ajax. His time at Ajax showed that he could nurture talent while also implementing a style of short passing football that Barcelona showed an interest in on numerous occasions. It can be speculated that Buckingham took this style of football from Arthur Rowe’s early development of the ‘give and go’ at Spurs in the 1940s (the club which Buckingham spent most of his playing career). He practiced this game at Ajax where he found a teenage Cruyff playing and picked him out as a special talent and would later give him his debut with Ajax. Buckingham left Ajax with a title but not much else, eventually he made his way to Barcelona where he would find limited success. Michels (1971-75, 1976-78) would not only follow on from where Buckingham left off at Ajax, creating total football, but would also replace him at Barcelona where Michels would find significantly more success at both clubs. Michels won four titles at Ajax and one at Barcelona (along with a Copa del Rey during his second stint), making his time at Barcelona impressive but not era defining like his time with Ajax. At Ajax, he had brought about fluid attacking which saw players swap positions, something which was only seen with the other great sides like il grande torino. Again, Cruyff was a student of Michels, like he was of Buckingham, so he would learn from his success’s in the Netherlands while also what changed at Barcelona. Menotti (1983-84) can be seen as the third notable pre-Cruyffian to come to Barcelona winning a solitary Copa Del Rey win during his reign. Menotti was a great argentine coach who brought in a unique south American style, playing a 4312 which guaranteed a certain amount of flair and beauty which he had instilled in the Argentinian League as well as at the national team. However, Spanish football would show the dents in his armour as La Liga football appeared to be too fast for his liking. His team seemed like it was always just a few seconds away from doing something extraordinary, but the other sides were not going to give them that kind of respect or time. Maradona’s frustration was remarkably shown during his outburst during his final game at Barcelona. There were other managers in this period who were not ideologues like those previously named but still had the same issue which all the others shared. Helenio Herrera was brought back to the club, after his time with Inter, to see a second stint at Barcelona and a third, both being unimpressive. Udo Lattek was employed, making him the second great German manager at Barcelona (Weisweiler being the first), and won the cup winners cup with his focus being on the players being physically prepared while he would be tactically simplistic. Lattek would allow the players to have some freedom on the pitch when it came to systems, player roles and tactics. The non-Barcelona coach who I will mention here is not someone I would call a pre-Cruyffian but is somewhat a precursor in terms of effect on their club and success in Spain. Miguel Muñoz won 9 titles and 2 Champions leagues at Real Madrid, so was actually more successful than Cruyff. He was another attacking coach, but he came from Spain and had dominated the league during the time of Di Stefano and Puskas. His style could be best described as directed chaos by pointing Real Madrid’s generational talents at the opposition and watching them smash down any obstacle. Munoz did have some structure as he implemented the 1-2 passing style that would allow his talented players to make their way up the pitch with some forward momentum. The squad was filled with the best players in the world who could outclass any opposition technically, so it made sense to allow them the room to do so. Munoz was able to work with the established club that was Real Madrid and facilitate the ability of world class players rather than build up to an idea. Real Madrid were still an incredible team during the 1950s and 60s and Munoz was the man who was there for much of their success. However, Munoz came from a different time and would have shared the same issues as the pre-Cruyffians if he had inherited the same squad as them but used the same style of play. Their universal issue when it came to their approach to Spanish football was that they lacked a clear and concise game plan when it came to attacking the opposition. While Buckingham, Menotti and Michels all were attacking coaches, none of them limited their players in the attacking section of the pitch. Their ideologies were about giving the players room and flexibility in their attacking and allowing them to be the best player possible while entertaining the crowd. That is not what Cruyff was about. For this analysis, Cruyff will be seen as he pivots by which we view Spain’s cultural football shift. His impact goes beyond the simple tactical effects but also into development of youth players as well as how fans view football clubs. However, we can start with the tactical outlook which Cruyff introduced in the 90s with his 3-4-3 at Barcelona. He made himself differ from the attacking coaches of the past by have some recognised rules which were held over the team as religiously as a defensive coach would train defensive positioning. The key rule (the one which Guardiola certainly holds sacrosanct) is the need to have a numerical advantage in both the midfield and defence. Cruyff was not an ideologue, as he wanted to win, but he would have certain tenets which he would maintain when he had strayed outside of the pale. He believed that these rules were the direct methods to give him the best chance of winning game. Along with his believe in an extra man, he would also stress the need to control the game by having possession of the ball. With that possession, the ball could be moved forward using the ideas which Buckingham had passed to Cruyff: that after a player passes, he must then make a run which provides an option for the ballcarrier. While these rules seem somewhat simple by modern standards, they were just the basis for what Cruyff would create at Barcelona. They brought the club to a run of league titles and a champions league win that would define an era for Barcelona in a way which they had not seen for years. He swapped from the Dutch 433 to a 343 (diamond) when arriving at Barcelona but this would require very specific personnel. Cruyff’s defenders would need to be agile and mobile so that they could cope with the high line that comes with possession play. An intelligent defensive midfielder would be needed who could both stop opposition counters while still connect the midfield and defence when transitioning to attack (giving the defence a passing option at all times). The two central midfielders would be needed to create further passing options while also making the runs to support the attack. The attacking midfield would complete the midfield diamond, staggering out the midfielders between the opponent’s line in a way which allowed for more progressive passing options. The wingers were needed to create as much width as possible (as the centre backs would be positioned in a very wide fashion to make up for the absence of traditional full backs). These wingers could make runs to the inside but only if they had the ball on the wing and passed the ball to the centre (creating a run that would manipulate the shape of the opposition defensive line). The striker would mainly act as a target but needed to have decent ability when it came to passing and receiving the ball. Many driven passes would be aimed at him, either using him as a bouncing board to connect with another player or to challenge the opposition defenders. 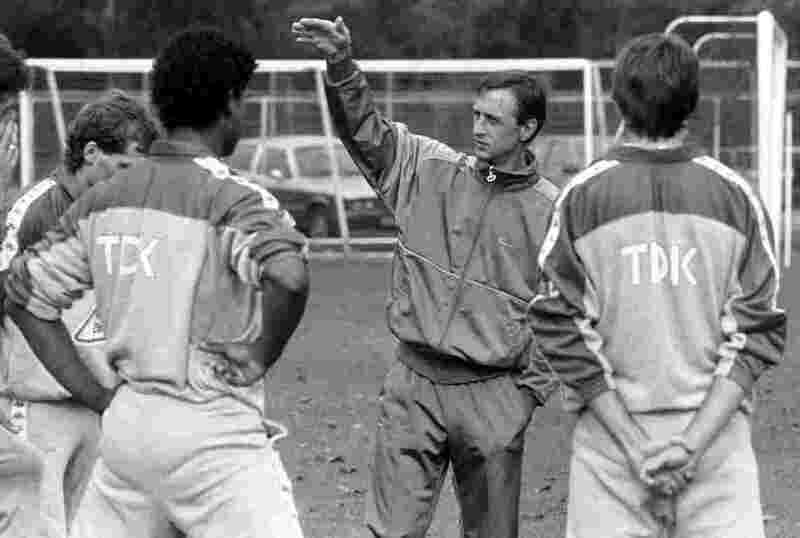 The main goal of Cruyff’s team was to manipulate the oppositions shape, finding space that a runner could exploit. The 3-4-3 and the roles which each player had would create a new passing map, rarely seen in football before, which had many different horizontal layers for moving the ball forward and creating passing options. This approach would play off the defensive approach of some of the teams from La Liga in the 80s, Athletic Bilboa being one of them. Javier Clemente would win a double and two league titles with Athletic Bilboa over his time at the club by playing a defensively focused game. Bilboa was an industrial city, so Clement made the team match the local mentality of being diligent on pitch (helped further by the clubs recruitment policy which would see extremely loyal and committed players signed from the local regions – something which Bielsa would later run with when employed at the club). They were not tactically complex as they would play an aggressive man marking system which used the traditional stopper/libero four man defence. Instead there was a focus on outworking the opposition, even disregarding the need to be technically flashy to win. Clemente wanted his players to stifle the opponents talented players and counter with the pacey wingers or send a long ball to the strikers. Often times they were reckless in their structure due to their workrate and man marking system, something which would be easily foiled by the positional play of Barcelona during the 90s. Any space exposed would have been exploited if a man marker vacated it. However, against the pre-Cruyffians this approach would starve the attackers of options and space as they did not have the right passing map or instructions to deal with it. In game, Cruyff’s team would always have the wide options to pass to. This was a necessity to pull the defence apart and make use of space that would be present on the less populated wing positions. The deepest midfielder would often act like the metronome for the team (something which Menotti often player with), keeping the ball moving to the wide positions if the forward pass was not on. The three centre backs would need to be positioned in extremely wide manner to allow the wingers to take such positions while also making sure that they covered the area behind the high backline. Nevertheless, Cruyff was more interested in attacking and was gifted with Ronald Koeman, the midfielder who played in defence, whose passing ability gave his extra man in at the back an excellent platform to start build up play. This passing ability was instilled in most positions on the pitch and only improved as Cruyff grew into the club, with players becoming more and more comfortable making incisive passes which the commentators in the stands could barely see, no matter the average player on the pitch. Cruyff would train his team to be a cohesive unit that understood the need for technical ability but, more importantly, intelligence in movement and positioning. The players would become familiar with their teammates runs and natural position on a near psychic level, making it easier their colleagues to predict where each man would be. One of the most important aspects of Cruyff was his self-awareness, tactically. He knew he was strict and this could lead to a formulaic form of attacking which could be predicted and if something can be predicted then it can be prepared for. So Cruyff ended up buying players like Laudrap, Stoichov and Romario over his years at the club with each playing in different areas of the pitch. What was important about these players was their irresistible flair which could amaze the crowds and bewilder defenders. Their addition to the team meant that Barcelona were never without a surprise. Football is not an exact science, even if you have more possession, create dangerous chances and defend well, there’s still a possibility of losing. Cruyff’s flair players were seen as the antidote to this eventuality. They prevented Barcelona from being to formulaic but were also the safeguard against the unexpected due to their own ability to do the impossible. The Dutchman also had a focus on youth development which saw the club instil a set of values in the youth teams which matched the first team’s. This meant teaching them the tenets of positional play and creating intelligent footballers. Additionally, Johan was very connected with the Catalonian people and loved the city of Barcelona. Therefore, he wanted the club to give back to the community and have sure that there was a connection and honesty that the club could be admired and set an example. Even after his retirement, he would play a big role in overseeing the clubs progress and making sure there was a consistent plan to build on. Van Gaal would continue Cruyff’s work at Barcelona by replicating the same level of success which came before, as well as keeping to a strict and complex approach to attacking football. He did return to playing 433 with a slower mentality when holding possession than Cruyff but he strove for a greater level of footballing perfection than Cruyff did. Van Gaal was also not as self-aware as Cruyff when looking at his own approach to the game as he would continuously view his system as an attempt to create perfection. If Cruyff was an ideologue, then Van Gaal was an extremist ready to die for his cause. His system would change from club to club, but his ideas and his approach were unrelenting in the face of whatever challenge he was faced with and, to be fair, he is an incredibly successful manager. There is a feeling that he may have viewed himself as being in Cruyff shadow, making him believe that he would need to set himself apart from Cruyff. This led to an on and off feud between the two Dutchmen, despite them both having more in common than other managers that they befriended in their careers. A notable aspect of Van Gaal approach was how he would break down football into four parts, attacking, defence and the transitions between those stages. By doing this he was able have a more structure view of the game and how to approach training and tactical changes. Most importantly, it allowed for a quick method of breaking down how the opposition played by looking at how they would approach each stage of the game. Did they want to have a very quick transition between defence and attack through counter and did that phase often occur on the wings? You would be able to see this is you just watched what happened when the opposition won the ball (Defence to Offence transition). Personally, breaking the game down like this is how I analyse football and allows for a quick interpretation of how a game is going on a shallow tactical level. The arrival of Pep Guardiola signalled the change which had been in the works for years. Rjikaard had been successful with Barcelona in the period between LVG and Pep but he had reverted the approach back to a less complex form of attacking football. Guardiola took the complexity of attacking to completely new level, one which had never been seen before, with clear inspiration from Cruyff and Van Gaal. The time was right for Barca in more ways than one though, as those years of Dutch influence had not only crafted the perfect manager for the style but had also cultivated the perfect club environment to harvest the right kind of youth product and technical coaching knowledge around FC Barcelona. I don’t want to spend too much time on Guardiola, as there is so much material out there to be read about him, but I will lay out his part in the Cruyffian legacy. There were new rules which were implemented on top of those which Cruyff had established, with one the most notorious being the need to pass the ball 15 times in the defence to attack transition phase of the game. Pep viewed this as the theoretical minimum number of passes needed to establish the positional system for the team to start making the proper runs to displace defenders (did not mean Barca were not able to counter attack well, just an idea to demonstrate how Guardiola wanted his team positioned). Additionally, the counter press was employed to make sure that the control of the game was maximised in Barcelona’s favour. It worked on a five second rule, which saw the team press the ball intensely when possession was lost. The positional overloads which the team was creating when in possession of the ball would allow for the counter press to have a pre-established basis to limit the opposition ball winner’s space on the pitch. (The counter press can be seen just as much as an influence of Van Gaal and his view of transitions and positioning on the pitch.) A final important rule (theoretically) was earning the right to make a run into the box, meaning that a player had to contribute to the build-up play or create space to be exploited before they could make a run into the box. This made Barcelona a more effective team who only made runs when the opportunity was present (which is why there could be long spells of possession). While these ‘rules’ were in place, if there was space and room for the counter then the Barca players would take it. This style of play would rule the world for so long that it looked nearly unbeatable, until the German revolution sweep through European competitions and displaced the Spanish from their throne for a period of time. This was seen when Barcelona were demolition by Bayern Munich as the same happened to Real Madrid by the hand of Borrussia Dortmund. This was possible by creating a complex form of pressing football which could match the similarly complex form of positional play which the Spanish were playing with. Bayern and Dortmund were able to press the ball while also using the cover shadow of the pressers to prevent any new space from being presented behind the players while the presser’s teammates covered all other passing options. When Luis Enrique took the helm of the club after Tito Villanova, he would employ a more direct form of attacking football which departed from Barcelona’s previous ideals and he would bring in Neymar (a signing which fit in more with Real Madrid’s portfolio more than Barcelona’s). Despite their massive success, this was when Barcelona seemed to stray from, what most would have said, made them so iconic amongst the other legendary sides of the past. In my opinion, this set of managers did not take so long to appear simply due to the difficulties in understand the style of football. They needed a certain minimum standard of technical ability across the board, including goalkeepers, defenders and strikers. By the 2010s, Spain were producing a great number of technical footballers in all positions (even if many had deficiencies in other areas of their game). Once these footballers were being produced, a committed possession-based style was possible at a lower level club. These managers were then able to come in and play with the ideas which Cruyff had developed in the 90s. However, the most interesting manager of the post-Cruyffian’s would have to be Jose Mourinho, the fallen angel of Barcelona football (as Jonathon Wilson describes him). He was a translator for Bobby Robson and then coach for Van Gaal at Barcelona where he learnt his trade before making the jump to a head coaching role. He was at Barcelona when players like Guardiola and Luis Enrique were players so was in the same environment as the coaches who would one day manage Barcelona. Mourinho takes the rules of Cruyffian football but he flipped the spirit of it by embracing a defensive style of football. The need for an extra man in the centre was no longer applied to passing options but applied to preventing overloads in defence by having an extra marker. He understood the goal of positional play was to misplace the opposition, so he made his teams extremely tight in their defensive structure when playing against the Barca style. Mourinho was so successful that he took Porto to the top European achievement of winning the Champions league. After his stint there and at Chelsea (where he did prove he could create a brand of attacking football in some form), he assumed that his next job would be with his first employer, Barcelona. They rejected him for Guardiola who was an unproven manager but also former player with Catalan heritage (everything Mourinho wasn’t). This relationship and his intimate knowledge of Cruyffian football was what made Mourinho the textbook foil to Guardiola and what he represented. He was the textbook foil not because of he was the opposite, but because he was the unwanted brother of the family. Mourinho would prove his worth against Barcelona twice, once when at Inter Milan in the champions league, knocking Barca out and a second time at Real Madrid, where he set the new record points total for the Spanish League. Ironically in comparison to our current thoughts of Mourinho, when he played against Barcelona in the 2011-12 season he had his team play a relatively high line with a focus on prevent Barcelona’s midfield player from having the time to start their attacking transition. He also had his team snap into tackles if the Barcelona players tried to turn toward goal and would have the central midfielders marshal the mazy dribblers of the Barcelona team to the wings where they could not do as much damage. In attack, Mourinho did use Cruyffian method but applied them to counter attacking by having his players pass and move while also making sure that there were multiple options for the player when countering. This led to a 2-1 victory which seems like a reasonable result but for Mourinho it meant more than just the three points. Cruyff was an anomaly. A world class player (probably one of the best of all time) who would translate his success to management and create a bigger influence after retirement than he would during his playing career. This was due to the fact that he was not just gifted with a create pair of feet but was clearly taught the game of football in manner that few will get to equal. It’s hard to find more ways to praise the man that have not already been written or said by those more eloquent than me. So, I’ll focus on another area. Splitting this timeline into three (Pre-Cruyff/Cruyff and Post-Cruyff) can be slightly misrepresentative, with there being periods of time that I have tried to fill with the additional sections. What is more important than that is seeing the clear line of development in this style of play which inhabits such a huge role in modern football. This is a style that ran the world for years and still shows complete competence at winning league and impressing even the most stone-faced football fans. I don’t believe the development of this style is over, but I don’t see it changing anytime soon, as we are too close to the success and presence of Guardiola. To find the true introspective view of this playstyle and where it goes, you need to be able to look back on it with a clear mind that is unaffected by the biases held in looking at something from the present. Maybe once the players or viewers of Guardiola’s style have retired or matured and gained a new perspective, they can push the dialect forward, instead of creating insipid imitations.